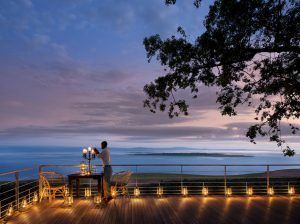 Upon arriving at the spectacular Bumi Hills Safari Lodge, part of the African Bush Camps collection, you’re overcome by the vastness of Lake Kariba. 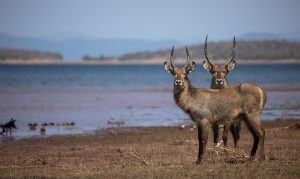 One of Zimbabwe’s national treasures, this is not only the largest man-made lake in the world (spanning over 540, 000 ha) but also a source of abundant wildlife due to its endless networks. This haven provides guests with the ultimate Zimbabwean hospitality, using resources endemic to the region to curate an intimate and bespoke itinerary for guests. All activities are complementary and you’re invited to discuss ideas for day trips with your guides. 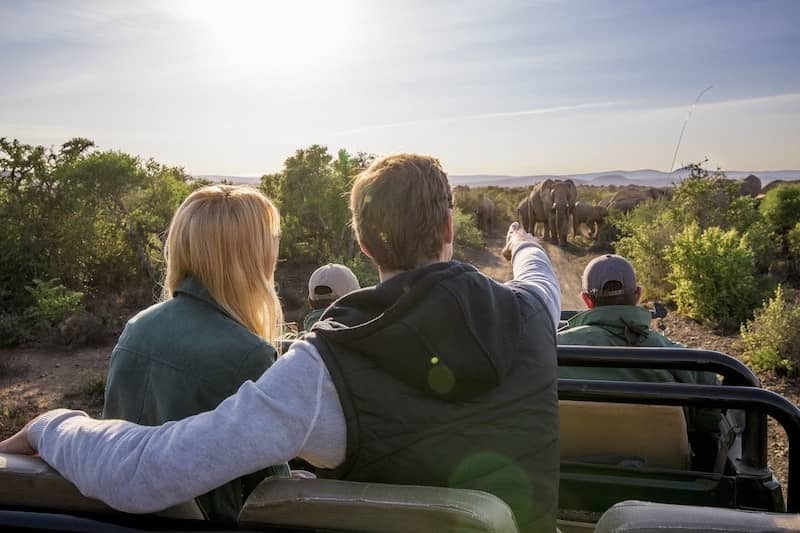 Alternatively, allow them to take you out on a range of sensational wildlife and adventure excursions to suit your interest, fitness level and time frame. Bumi Hills is a tranquil and intimate escape in the wilderness of Zimbabwe with an unrestricted view of the lake. Standing on the lower viewing deck, you notice how as the wind picks up, it creates waves that mimic the ocean and spill onto the orange sands of the banks. At at dusk, the waters become completely calm and the lake appears to the eye as a glass façade. Zimbabwean people are known for their warmth and the staff at Bumi Hills are no exception. You are greeted with a big smile and guided through a space adorned with soft silks and pastel tones. As darkness falls, it calls for lanterns to be lit around the viewing deck, making for a dream-like spectacle. 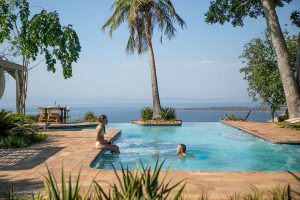 Most of the lodge faces the waters of Lake Kariba, making for an impressive morning wake-up call as well as a romantic evening glow from the comfort of their sophisticated rooms. While the lodge suits families (even with smaller children) and couples alike, the tranquility of this destination is ideal for honeymooners. 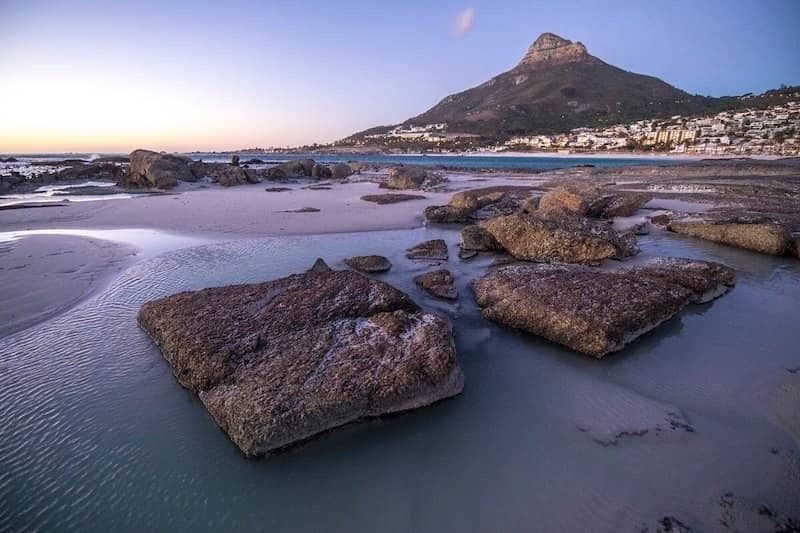 From spa facilities where couple’s massage therapy, facials and other treatments are offered to the silence and ambiance of the surrounds, loved-up pairs are allowed ample opportunities for romance. There is so much to do at the lodge with Lake Kariba directly on its doorstep. 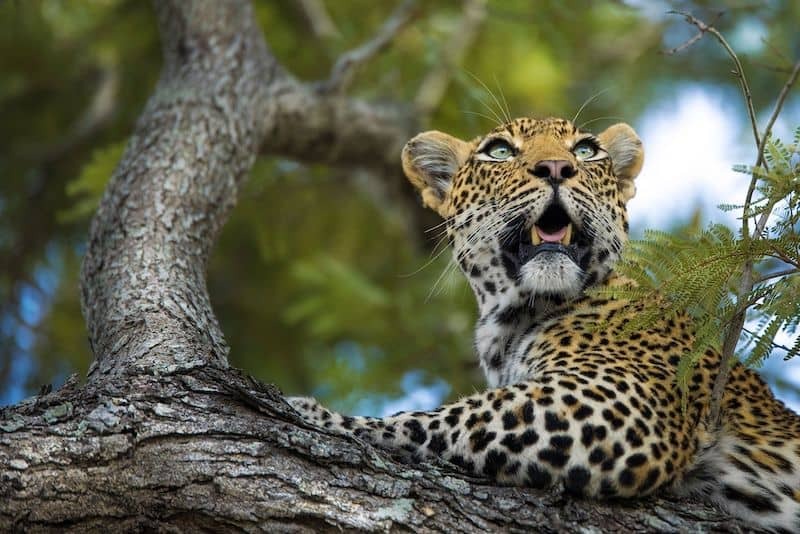 The day begins with a whirlwind game drive, venturing deeper into the reserve in search of kudu locking horns or buffalo grazing in the lush grasslands. 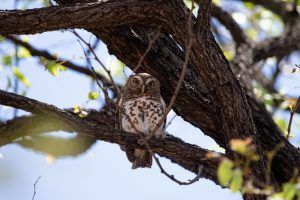 The lodge’s star activity is of course the walking safari where you can connect more closely with locals and wildlife by joining your expert guide on a trek through the bush. Feel the breeze as it rustles through the long grass of the savannah and alerts the animals of any dangers approaching. Let your guide stop, point out paw prints and lead you in search of their owner – if you’re lucky, they might belong to a big cat! There is nothing like the thrill of stepping out so close to these creatures – definitely an irreplaceable experience. 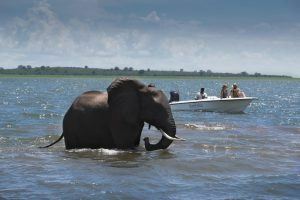 After freshening up, go fishing in the lakes where you’re sure to get a show from the resident elephants. Another way of game viewing is by boat where you cross the expanses of Lake Kariba, observing birds fishing and hippos surfacing. This activity can also be paired with a sunset cruise that’s only improved by having your favourite drink in hand. Another highlight is to embark on a cultural tour of the traditional villages where the local Tonga people give you a taste of their musical skills and crafting abilities. 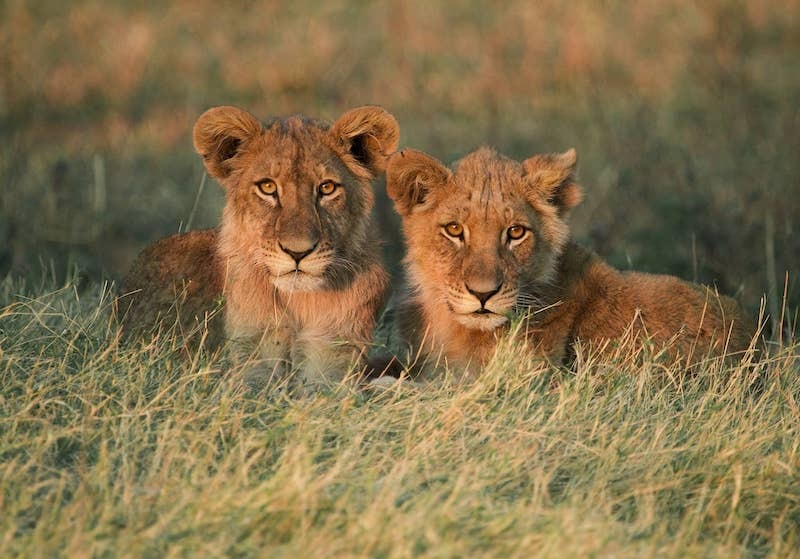 For children there is even a Cub Club that follows one of the rangers through the nearby bush while they educate them on different flora and unveil to them the wonders of African wildlife. However, if you’d prefer to unwind in the sanctuary of the lodge, you won’t be missing out on the creatures that roam the lake area. Witness wondrous elephant herds that wade right across the shore of the lake and astounding birdlife such as orange-winged pytilia and broad-tailed paradise-whydahs that flit up to the viewing deck from the dry thickets. End your day with a bit of stargazing, either from one of the main decks or your own private balcony. The lodge consists of just 10 Lakeview Suites which have all been built with clean lines and a modern aesthetic in mind. Walking through, you can’t help but admire the traditional artworks, some of them carved from driftwood or woven by local crafters. With ample room to move through the space, the rooms are designed with nooks to unwind in as well as a dreamy spa bathroom for pampering baths. But it doesn’t stop there – stepping onto the balcony you’ll find an outdoor shower with stunning views of the lake. 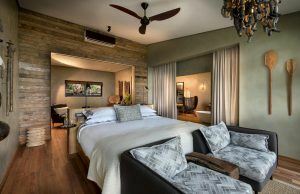 For those looking for either a family room or a house to use with friends, there is the Baobab Villa, a two-bedroom private suite. Expect treats and surprises such as a complimentary bottle of champagne for honeymooners or afternoon confectionary on the shores of the lake as the lodge goes above and beyond to cater to their guests. Meals at the lodge are an expression of the soul of Bumi Hills – sensational and enchanting. Start your days off with breakfast on the main dining deck, moving on to game drive snacks and drinks before heading back for a lunch at your request. 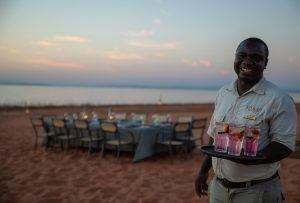 The dinners are the real highlight as they can be set up anywhere in the natural surrounds such as under the boughs of an ancient tree or overlooking the calm of Lake Kariba. The lodge is open all-year-round but boating and lake activities are better done from April to October when it’s not the rainy season. Sun-seekers on the other hand should aim for November to March when the summer months come around. 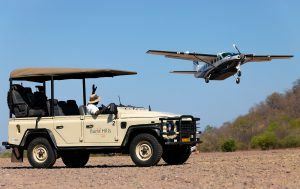 Bumi Hills has its own airstrip which is reachable in 1hr 30 min from Harare, 1hr 40 min from Victoria Falls, 1hr 30 min from Hwange or a short trip of 30 min from Mana Pools. You’ll be collected from here by your hosts who’ll prepare you for the trip of a lifetime! Book your romantic getaway to Bumi Hills Safari Lodge with one of Rhino Africa’s travel experts today and embark on a dream African safari. You can also learn more about Zimbabwe with our complete guide.